Planning a bridal shower isn't always easy, especially if you've never planned one before. What should the bridal shower invitations say? What bridal shower games are we supposed to play? What kind of gifts are given at a bridal shower? What kind of food should be served at a bridal shower? For your lucky Maid of Honor, family member or friend who has the honor of hosting the Bridal Shower, it can definitely be an overwhelming task. Of course she wants it to be absolutely perfect but she just doesn't know where to begin! So much research to do, so little time, and with a limited budget and resources, the planning part doesn't always turn out to be as fun as it should (and could) be. Of course you will love your shower and appreciate all of her hard work no matter what kind of shower she hosts but I'm making it nice and easy on you. I've partnered with Wedding Paper Divas and the BRIDES Influencer Network to plan the perfect bridal shower. All you have to do is click "order" and I've done all of the planning for you - from invitations to games to the thank you notes, it's all here and ready to go! Do you and your bridal shower planning bestie a favor and forward this article along. And I promise, you'll thank us. If you see something you like, just click on the image and it will take you right to where that item can be purchased! These gold foil bridal shower invitations from Wedding Paper Divas are simple, classic and are perfect for any bride-to-be! Add a personalized sticker for the most beautiful special touch! 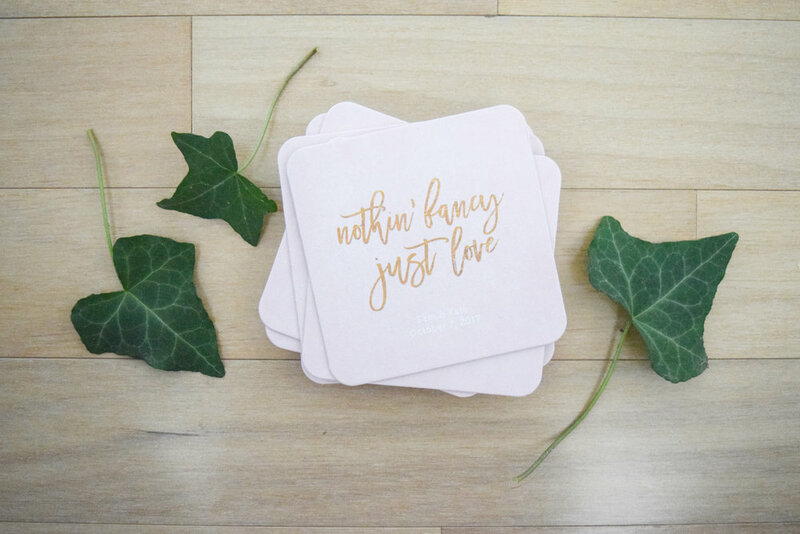 Whether you’re going with classy champagne, punch, soda or cocktails, these personalized cocktail napkins and coasters are the perfect addition. We love this fun little bridal shower guest book alternative, giving advice to the bride! Punch a hole in the top corner of each, attach them all to a key ring and she’s got the perfect little keepsake book from this special afternoon with her closest family and friends! You can choose from a full coursed meal, appetizers, or just a couple of snacks. And no matter which route you take, these gorgeous Menu Cards will dress up each place setting to perfection! These two bridal shower games - Bridal Shower Bingo and What’s In Your Purse - are the perfect addition to your afternoon. They are simple, short and sweet to bring just the right amount of fun without going overboard. Favors are always a fun little addition to the bridal shower. You can make homemade cookies, give personalized compact mirrors or even a little box of chocolates. Add these personalized tags to each and you’re good to go! And last but definitely not least, thank you notes! Because you’ll be getting lots of amazing gifts at your bridal shower, be sure to thank everyone with a hand written note. And especially, the wonderful woman who put it all together!